Unable to connect to TWC's CableWiFi? I was in a L.A. Japanese restaurant and noticed on my old iPhone 4S with its iOS v8.3 on TWC's CableWiFi. I tried to connect to it, but it failed quickly (unable to connect or something like that rrror). How come? Its signal strength was strong too. Re: Unable to connect to TWC's CableWiFi? Did you ask the staff? No since I didn't know where it was from. It was in busy crowded area. Unknown if it was really TWC's and not someone pfishing... unknown if it was actually on line... Does it show up in TWC's wifi finder ap? I didn't have the app yesterday when I checked, but did check at home. They looked correct to me. Is there a way to tell the differences from the fake ones? I wonder if I couldn't connect because too many people were on it? If you connected to one (a TWC or Cable WiFi) before it should have connected automatically (like any WiFi you have logged into before). Does not care where it is. I have connected to a few since the first one I connected to with my iPad. Look for the lock symbol to show it has "login required" (secure) which would more than likely show it as legitimate since a phisher would leave site open. After connecting (not logged in yet though) and go to a browser to enter your username/password and accept the terms. Hmm, I don't recall if there was a lock symbol or not. All I remember seeing their SSID names, manually connecting to them, and connections failed right away (refused). 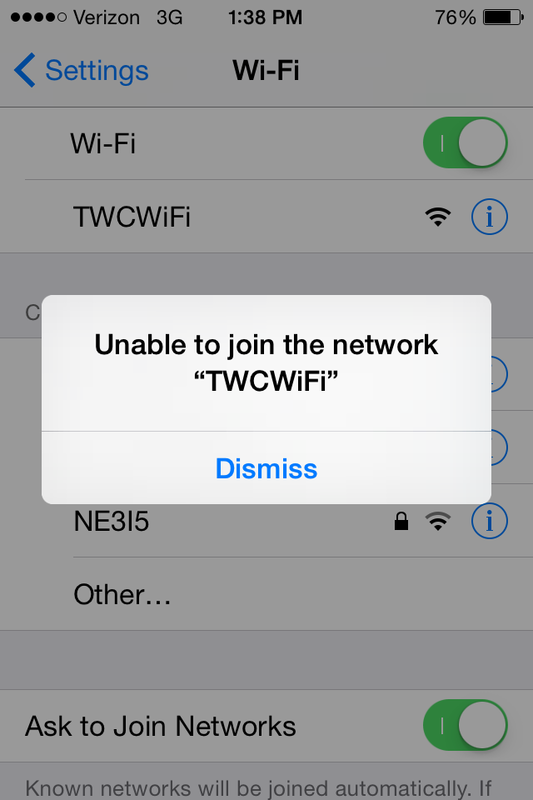 I tried again in another city with its TWCWiFi AP while waiting to get an automated car wash. It also said "Unable to connect to join the network 'TWCWiFi'" [Dismiss button]" -- http://i.imgur.com/rbNAN4O.png for a screen shot/capture. There were no lock symbols too. Same for "Cable WiFi" AP. I wonder if this iPhone 4S, with iOS v8.3, is too old? FYI, I have never connected to one before.